Released alongside Film Movement's Faces of Israel four-disc film collection of works which offer viewers a snapshot of the complexity and diversity of life in contemporary Israel, the companion box set Beyond Borders celebrates the differences that unite and divide us in a humanistic trio of titles set in the United States as well as the topical region. But rather than take you through them alphabetically or chronologically, I'm taking a cue from the films included in Borders to go beyond the expected – serving up a review of the titles in the order I'd recommend watching them for the greatest cinematic impact. 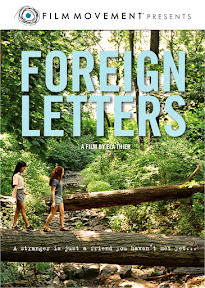 Although it’s included alongside A Bottle in the Gaza Sea, Ela Thier’s largely autobiographical effort Foreign Letters makes a first-rate companion film to the thematically similar, likewise female (co)directed tale Arranged which seems to continue on with the thesis of intercultural female friendship established in Letters. 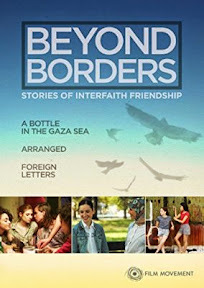 Easily the best starting place in the Beyond Borders box set celebrating interfaith friendships from the Film Movement catalog, the work chronicles Thier’s own adolescent struggles to navigate life in a new nation where she could barely speak the language. As the sweet, succinct, 1982-set story begins, the twelve-year-old Ellie (Noa Rotstein) writes what the audience quickly gathers is just the latest in an ongoing series of letters from America to her “best friend times infinity” back in her former Israeli home. Charting the timeless struggle of not fitting in to not knowing where to sit at lunch, Thier takes a cue from the Peanuts specials of yesteryear by translating the English language instructions of Ellie’s everyday teacher (outside the ESL classroom) into veritable gibberish in her feature-length adaptation of her acclaimed short A Summer Rain (which is also included on the DVD). Thier’s subtle portrait of coming-of-age in a brand new country slowly but steadily picks up momentum as Ellie finds a friend in a fellow outsider via the Vietnamese refugee Thuy (Dalena Le). Shy and studious as well as just as self-conscious as Ellie, the two girls begin testing the waters of a fledgling friendship that was initially forged out of loneliness and necessity before they soon discover that their differences are nowhere near as important as their similarities. Educating themselves about life in their new surroundings, the girls balance one another out while also giving each other the vital self-confidence they need to stop hiding in the shadows of a school that isn’t nearly as ready to accept them as they are ready to accept both each other as well as everyone else. While it’s a bit structurally underwhelming as we get the feeling that Thier wasn’t entirely sure what to do with the production’s full ninety-nine minute running time (versus the original seventeen minute short which also utilized the same talented young leads), Letters nonetheless manages to overcome the bumps in the road to leave a lasting impression. Furthermore, the film’s sheer authenticity elevates Thier's work as a timeless portrait of female adolescent existential angst that resonates as strongly today as we imagine it would've if released in its original 1982 time period. Thus in spite of a floundering middle act that gets bogged down with somewhat episodic plotting, we're more than willing to take a cue from Ellie and give it some time to find its way. A moving and sensitive salute to the importance of human connection as well as a completely preach-free reminder that we’re all humans with the same wants, needs, fears, laughter, and tears regardless of our language or homeland, Thier’s autobiographical cinematic journey results in one of the best family friendly offerings in the entire Film Movement catalog. Reminding viewers of the rewards that await us when we dare to look past the popular lunch table of cliquish Twilight style commercial friendly studio fare, Foreign Letters serves as an excellent “starter” picture to introduce middle school students to the world of international filmmaking by way of characters they can relate to that likewise have something of quality to say. Adapting a work from the “tell me” medium of literature to the “show me” medium of film is difficult enough as it is without even considering the fact that for the title in question, the story unfolds largely through the written word as the most pivotal sequences revolve around the sending and receipt of e-mail messages. 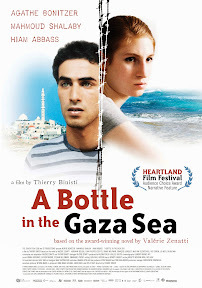 Of course, considering that the characters at the heart of A Bottle in the Gaza Sea are a French born seventeen-year-old Israeli girl (Agathe Bonitzer) and a twenty-year-old Palestinian boy (Mahmoud Shalabi) who found her cyber address included in the titular bottle, it’s safe to say that Gaza isn’t your typical pen pal saga. Wanting to make sense of all of the suicide bombings that occur on her side of the water, the beautiful idealist Tal sends her query out to the unknown via her older brother who’s able to hurl the bottle into the Gaza Sea while carrying out his required military service. What begins as a heated, blame-filled exchange of sarcasm and oft-heard clichéd generalizations gradually blossoms into something much more substantive as the two share their thoughts, typed snapshots of daily life, and later actual photographs that make them realize that if they’d met anywhere else under ordinary circumstances there’s a pretty strong likelihood that they would’ve become friends. 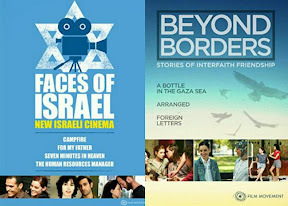 Part of the three disc Beyond Borders collection crafted to explore interfaith relationships, while Bottle might hold up well on its own, unfortunately when viewed alongside the other two vastly superior titles included in the set, it’s the weakest entry in an otherwise staggeringly impressive triple feature. While the thematically similar Foreign Letters is much more natural in its approach, the admirable effort put forth by filmmaker Thierry Binisti to capture both points-of-view and likewise evoke empathy for each character (while simultaneously pulling you in two totally different directions) makes the film seem much better than it actually is in the end. An unapologetically hopeful work that’s bogged down by awkward performances and emotionless English language line-reads by its young actors (which should've been subtitled along with its foreign dialogue), Bottle is an otherwise well-intentioned attempt to translate Valerie Zenatti’s award-winning novel to the screen. Though you wish the final result would've been far more compelling, Bottle stays afloat – getting better as it continues – which results in a surprisingly moving final sequence that’s guaranteed to stay with you. 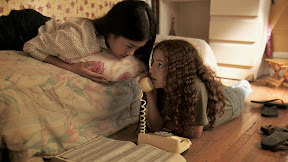 Largely wordless and therefore much more effective at conveying the real unspoken bond between the characters as two kids who connected (versus the filmic opportunities to take advantage of politically correct speechmaking), the gorgeous depiction of idealism and acceptance butting heads with bureaucracy conveys everything the filmmaker was trying to say in its memorable conclusion. As it stands, it’s a lovely throwback to the same spirit of youthful rebellion tempered by the futility of circumstance found in the final frames of ‘50s and ‘60s French New Wave cinema (followed by the British and American pictures it influenced for a majority of the late '60s and '70s). Moreover it’s further proof of not only Binisti’s artistry but another reminder to those adapting novels in the future that there is indeed a better way to tell the story than through too many voice-overs and shots of inboxes on computer screens. "Someone should be shooting a commercial for world peace," fourth grade teacher Nasira Khaldi (Francis Benhamou) jokes to her coworker turned friend Rochel Meshenberg (Zoe Lister-Jones) when the two women bump into one another in a New York park and encourage their younger relatives to play together. 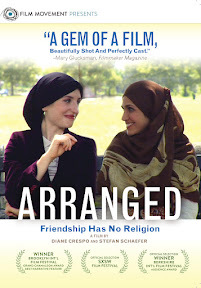 It’s a recurring joke throughout the inviting, original and warmhearted American independent film Arranged that focuses on two young women in their early twenties who, despite their religious differences as a Muslim (Nasira) and an Orthodox Jew (Rochel), are both dealing with similar issues of parental pressure and familial obligation in the quest to marry the two teachers off. In Rochel's case, this tradition calls for utilizing the talents of a matchmaker who pitches men to her client as if she’s selling automobiles by evaluating their job performance, sustainability and prominence. However for Nasira, it’s a bit more laid back as their father invites over a much older family friend in the hopes that his young daughter will find love with an uncouth gentleman prone to chatting animatedly with food in his mouth. Meanwhile Rochel contends with a series of disastrous matchups including a painfully awkward first encounter with a man who acts as though he’d rather voluntarily show up for a root canal than a date, along with one man who lets himself into the place and proceeds to snoop through everything while running at the mouth his own sales pitch covering his accomplishments. Both targets from their female principal who, in trying to compliment their beauty patronizes their beliefs by offering them money to go out and buy designer clothes and have a drink to start taking advantage of the women’s movement, the two modestly dressed new teachers sit singularly at tables away from the more daring and cliquish women their age at the school. However, the film's leads really hit it off when children question whether or not they hate one another because of what they’ve heard on the news. In offering the students a unity circle exercise, Rochel and Nasira conduct their own diversity celebration that seems to be far more accessible than the perfunctory district mandated training shown at the start of the film. Sure enough as the women begin spending more time together away from work, they realize they have far more in common than they first assumed. Touchingly authentic and believably executed, directors Diane Crespo and Stefan Schaefer’s appealing film was a hit in the film festival circuit. An official selection at the South by Southwest Film Festival and the Miami Jewish Film Festival, Arranged earned the audience award at Berkshire International Film Festival as well as the Grand Chameleon Award for Best Narrative Feature at the 2007 Brooklyn International Film Festival before making its way to DVD from our friends at Film Movement.